Limiting access to inventory is a great reason to look into high-speed doors. These doors are usually metal panel construction that runs in a sturdy track channel to prevent prying the door out of the frame at the sides. The value of fast open and close is to prevent unauthorized access at all times. 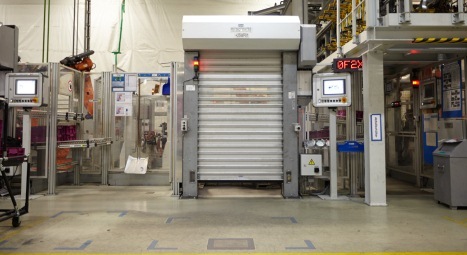 These doors are a little slower than many other high-speed doors because of the weight they must lift, but a lift speed of 36″ per second is much faster than a conventional door. When you want to limit access at a building opening yet need air to pass through in order to maintain a reasonable work environment, vinyl mesh panel doors are the choice. The mesh openings are so small they keep out all but the smallest of “no-see-ums’ and dust while allowing ventilation of the work area. These high-speed doors are often available in a variety of operation modes from manual chain lift and lower, to 18″ – 48” per second lift with push button, lanyard pull, remote control or sensor eye activation. Many of these doors have a self-repair track that allows the door to take impacts that pull the door out of the side track and then re-align by opening the door and then closing it again. Keeping temperature zones at proper levels is difficult if people and machinery are constantly coming and going – especially if the entry points require manual opening and closing. There’s also the leak factor each time a door is opened as well as inherent R-value of the door itself. Thermal high-speed doors help you maintain temperature levels on each side of the door while mitigating the air exchange each time the opening is passed through. Because of the high open/close speeds of these doors, it’s much easier to maintain temperatures and save money on energy costs as well. 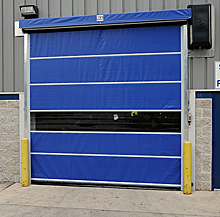 Speeds for these doors range from 36″ – 80″ per second and have a range of activation options. These doors vary in construction from heavy duty vinyl to light aluminum and steel based on the wind resistance rating you desire. Vinyl constructed doors can withstand up to about 80 mph winds with higher gusts. Metal constructed doors have a wind resistance rating of up to 130 mph straight winds. The vinyl versions of these doors often have the self-repair capability that allows the door to re-align in the track should wind speeds break over the rated value. The metal doors are also rated for weather resistance like rain and hurricane conditions. This is one of the best features you can look for in a fabric or vinyl door. This features assures that if a forklift hits the door while it is raising and pulls the panels out of the track, the panels will re-align on the way back down. This is also a great feature if you have a lot of wind where the door might get blown out of the tracks. Just raise the door and then close it, and everything’s back in place. There are several methods used for lifting and lowering high-speed doors. The least expensive is manual lifting either using a crank or chain lift. Beyond manually opening and closing the door, there are lanyard pulls where the forklift driver pulls up to the lanyard and then tugs on it to activate the door mechanism. There are also push buttons that can be mounted to a post or wall and remote controls that travel with the user. The most high-tech activation method of all is the use of a photo-eye or other type of sensor which triggers the door mechanism. High speed doors can be fabricated from rubberized material, vinyl clad mesh fabric, aluminum, steel and stainless steel. The type of materials used will determine how heavy the door is to lift and how large a motor will be needed to raise and lower the door. Each material has obvious advantage: rubber has a lot of give, vinyl is durable and lightweight, aluminum is more secure and lightweight, steel is extremely secure and stainless steel is resistant to washdowns and corrosive environments. Maintenance and repair costs are important in making your high-speed doors pay for themselves over time. How difficult is it going to be to get a door panel or several panels repaired should a forklift or other equipment collide with the door? Some high-speed door makers have designs that allow you to remove single panels and replace them rather than having to buy a new door. Ask your sales person before ordering. It will be important to know before buying as well as down the road when a repair is needed.